Sixteen members of the Carl Meade family are shown, above, as they waited for housing at the I.B.P.O.E.W. Lodge No. 176 on Harrison Street this morning. The family was left homeless and without food, clothing, Christmas toys or presents in the disastrous fire on Wineow Street last night. 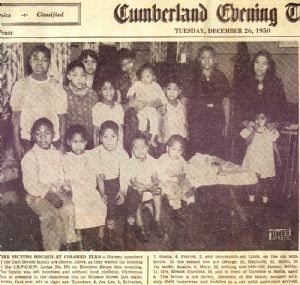 Shown, first row, left to right are, Theodore, 8, Joe Lee, 5, Sylvester, 7, Sheila, 4, Patrick, 2, and two-month-old Louis, on the cot with bottle. In the second row are George, 15, Reginald, 12, Helen, 25 (in back), Angela 8, Mary 22, holding one-year-old James; Bobby, 11, Mrs. Meade, Caroline, 16, and in front of Caroline is Stella, aged 4. The father is not shown. Members of the family escaped and huddled in a car until assistance arrived. The Improved Benevolent and Protective Order of Elks of the World, or the "Black Elks" as they are referred to, was founded in 1899 in Cincinnati, Ohio. The organization was formed in response to the fact that blacks were denied membership into white fraternal organizations. With 500,000 members in some 1,500 lodges around the world, the I.B.P.O.E.W. remain the largest African American fraternal organization in the world. It's stated purpose is, "that the welfare and happiness of it's members be promoted and enhanced, that nobleness of soul and goodness of heart be cultivated, that the principles or charity, justice, brotherly & sisterly love and fidelity be inculcated, that its members and their families be assisted and protected, and that the spirit of patriotism be enlivened and exalted."